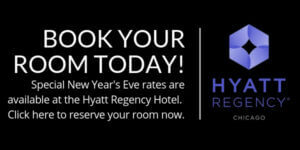 Navy Pier New Year’s Party 2019 Tickets on Sale Now! Chicago’s best New Year’s Eve Party returns for another amazing year at Crystal Gardens on Navy Pier. Revelers will ring in the new year from 9pm to 1:30am Monday, Dec. 31, 2018. As usual, this will be Chicago’s biggest SCENE and be SEEN NYE Party. Don’t miss getting a front row seat to one of the best midnight fireworks shows in the world! If you thought NYE was all about NYC, think again! Want to be on TV? Then purchase tickets to The Crystal Gardens NYE 2019 At Navy Pier because we are the Headquarters for NBC 5’s Big Live NYE Show! Discover this year’s ticket packages below.